CBE-102 : Battery Eliminator for Yaesu VX-8R, VX-8DR, VX-8GR, FT-1DR, etc. CBE-102 : NEW Battery Eliminator for Yaesu handheld radios. Fits VX-8, VX-8R, VX-8DR, VX-8GR, FT-1DR, FT1DR, FT2D, FT2DR, FT-2DR etc. (worldwide versions). 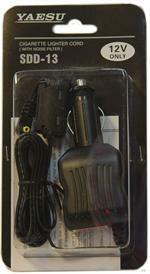 Plugs into 12VDC socket; has coiled cord; other end (battery shell with internal circuitry) clips onto radio. Enables hi-watt operation from vehicle cig socket or portable 12VDC power supply. Has built-in noise filter, current control, and voltage regulation. BC-102 : spring-loaded Belt Clip for FNB-102Li, FNB-102Li. OUT OF STOCK. BC-102 : Spring-loaded Belt Clip - for the FNB-102Li and FNB-101Li. It includes 2 mounting screws, and attaches to your battery pack. Fits original O.E.M. FNB-102Li, FNB-101Li, as well as the Batt. Amer. FNB-102Li. FNB-39: Yaseu-Vertex brand Alkaline battery case for the new Vertex VX-8R, VX-8DR, VX-8GR, FT1D, FT1DR, FT-1DR, FT1XD, FT1XDR, FT-1XD, FT2R, FT-2R, FT2DR radios, etc. Load with 3 x AA Alkaline cells for instant power. Includes belt clip.